Preheat oven to 350°F. Divide about 5 cups of pretzels into two large zip-top bags. Crush pretzels with a mallet or rolling pin and pour into a bowl. You’ll need 1 1/2 cups crushed pretzels total. Melt a stick of butter and pour on top of the crushed pretzels. Mix well and press the mixture into a 9-inch pie plate. Bake for 5 minutes. Let cool completely, about 30 minutes. Place about 15 to 20 small chocolate bars of any kind (about 2 cups) in the pie shell. Bake for 10 to 15 minutes until the chocolate starts to melt. Remove from oven and sprinkle 1/2 to 3/4 cup candy corn on top. Return to oven and continue baking for 10 more minutes or until the candy corn is nicely melted. Let the pie stand for 15 to 30 minutes before eating. Dear over-zealous trick or treaters and over-prepared candy hander-outers, I have the solution to your leftover Halloween candy problem: Combine all those leftovers into one glorious pie. This recipe is not for those with a weak sweet tooth. 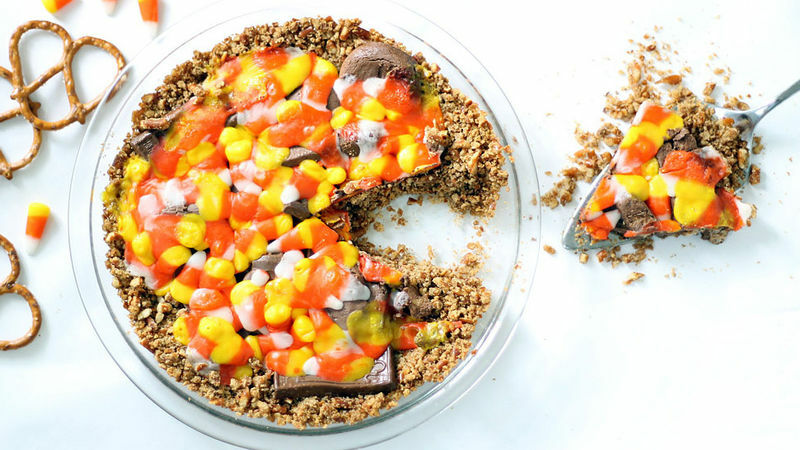 I expect total commitment to the candy pie, from butter pretzel crust through the melted chocolate to the candy corn topping. Years after I spotted this candy pie by Cakespy on Serious Eats, I’m still thinking about it. In my version, I added some salt to complement the sweet. Specifically, pretzels. Because pretzels and chocolate are the best pair going after rainbows and unicorns. Start with your pretzel crust. Preheat the oven to 350ºF. Pour a bunch of pretzels in a couple of zip-top bags. Crush and crush with a mallet or rolling pin until they’re finely ground. It’s OK to have some pretzel pieces in there. Transfer the pretzels to a large bowl. Pour the melted butter into the pretzels and stir really well. Then press the mixture into a 9-inch pie plate. Bake the pie crust for 5 minutes and let it cool totally, about half an hour. You can stick the crust in the fridge for quicker cooling. Unwrap about 15 to 20 of the small-size chocolate bars, or about 2 cups total. I used mostly all-chocolate bars, but you can add any kind you like, even those with cookie wafers, peanut butter, caramel, or whatever inside. Fill the pie so the whole bottom is covered. The candy bars should overlap some, too. Stick the pie in the oven for about 10 to 15 minutes until the chocolate looks all melty. Take the pie out of the oven and sprinkle candy corn on top. If you really love candy corn, go for the 3/4 cup. If you’re more meh about candy corn, sprinkle 1/2 cup. Return the pie to the oven for another 10 minutes, or until the candy corn is nicely melted. Remove from the oven and let the pie set about 15 to 30 minutes. Then dig in! The pretzel crust can get crumbly, so you might want to eat this pie with a spoon to not miss a bite. Just saying.